An example of an aerogramme posted in Australia (Calliope, 10th Mar 1954) and addressed to England and carried on the B.O.A.C. Constellation BELFAST G-ALAM flight to London which crashed at Singapore. 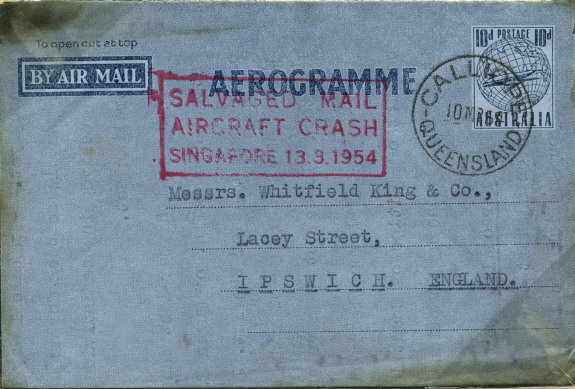 Most of the mail was salvaged and most of the mail for England received this red boxed three-line cachet: SALVAGED MAIL / AIRCRAFT CRASH / SINGAPORE 13.3.1954. (justified text).